Northland wrote: You are trying to theorize your way through a debate, while discouraging real world testing. Actually, I'm quite a fan of the scientific method, which of course requires experimental validation. But of course you have to do this real world testing properly. I on the other hand have demonstrated by way of practical experiment that your end of days scenario is entirely theoretical (for the 100A relay scenario at least) and provided evidence that the issue is easily solved using a capacitor. Unfortunately, a capacitor, especially a large electrolytic capacitor, removes the main reason for using a relay or contactor: galvanic isolation. As the gentleman in the video notes, there are applications for putting small, non-polarised capacitors across contacts (switches, like the points in old cars), [ edit: but he failed to mention that ] rarely if ever [ edit: should one be used ] across relay or contactor contacts. I have paid for more than 30 test reports done by accredited labs so I am more familiar than most with test procedures, documentation, standards and certification, shoving them under the authorities nose when requested. That's 30 products that had not been tested to AS/NZS standards. But now they are. Imagine that. Good for you. I certainly can't claim that level of familiarity with lab tests. OK. So why is it OK for them to do it, far beyond the rated current and rated voltage, but when I suggest using the latching relay as maintain only contacts it's dangerous and irresponsible? They are staying within the ratings. The few chargers that output more than 20 A actually use two relays in parallel. For higher power chargers (over 2.5 kW) they parallel entire charger units (so a 4 kW charger is really two 2 kW chargers in one box). By switching at nearly zero volts across the relay contacts, they are staying within the 28 V DC rating of the relay. Sorry, I should have come up with a simpler example. Last edited by coulomb on Sun, 03 Jul 2016, 19:59, edited 1 time in total. I mentioned the pip relays and when you said "these relays" it was safe to assume that we were still discussing the pip relays. But now it appears you have not addressed my point at all and used a different example. Or are you trying to tell us the pip relays (pv input) don't carry 60A at up to 115v? What are their ratings? "of course you have to do this real world testing properly"
Did I not ask for methods of validation? Perhaps you should offer helpful suggestions instead of implying my test methods are amateur and inadequate. "Sorry, I should have come up with a simpler example"
More sarcastic condescending arrogance like we saw in your earlier post. "a principle of isolating functional sections of electrical systems to prevent current flow; no direct conduction path is permitted"
My understanding is that capacitors do not have a current flowing THROUGH them. Current flows to and from them. Once the contacts are separated no current can flow to the capacitor. So how does it "removes the main reason for using a relay"? In the video he uses a resistive load and it does in fact work as intended. Why then, would it not work switching for example pv panels? I could understand if you argued that the capacitor would have some harmful effect on the pip, or cause other problems...but you didn't. You imply that it simply doesn't work and your evidence of such is throwing jargon at me, stating the capacitor will do something it simply cannot do. One of the things I intend to do with relays is move sets of panels from the pip to an external scc (would require 4 latching relays since they are N.O only). Real world current will be ~8A and ~80v. That's 640w. Much lower than my experiment. Another is separating banks of batteries from parallel banks. Real world current will be max 20A and max 56v. About a KW max, equal to my experiment. If I have overlooked some safety or functional issue I want to know about it. As far as safety goes, yeah I can see how voltage might technically be present on a contact that has just been turned off. But only a small discharge current accompanies it. And these connections should already be inaccessible to fingers anyway so I can't see a new safety issue. The capacitor will self discharge. Add a resistor if required. Now it's a snubber circuit (extremely common for relays among other things. But you already know that). Northland wrote: More sarcastic condescending arrogance like we saw in your earlier post. I'm writing as a moderator here. There is no place for personal attacks on this forum. For some strange reason, you are reading us all wrong. Coulomb is one of the least condescending, least arrogant, most patient explainers on this and several other forums. I mentioned the pip relays and when you said "these relays" it was safe to assume that we were still discussing the pip relays. I've now realised that a lot of confusion has resulted from my unfortunate wording. When I said "these relays" I actually meant "the following relays, that I happen to know the specs for". The relays in the PIPs are not the Omron ones in the Elcon / TCCH chargers, and I never intended to infer that they were. My apologies for the confusion. I might have a look at what the PIP's SCC relays actually are. Bear in mind that the SCC (Solar Charge Controller) can turn off its MOSFETs before disconnecting its relays, thereby avoiding arcing. It turns out that these are *automotive* relays. 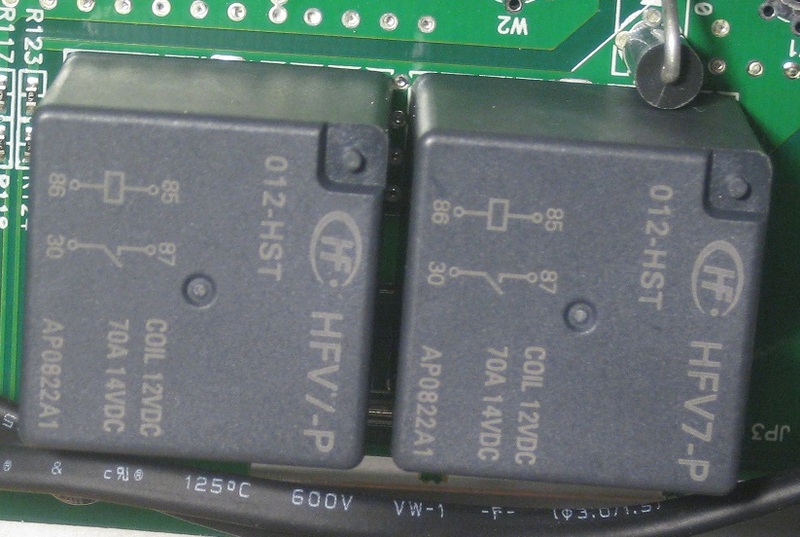 Although the case of the relay mentions 14 V, the datasheet says that they are rated for 40 A at 27 V. There is no AC rating given for these automotive relays. So these are presumably relying on switching (on and off) at near zero volts across the contacts. The yellow rectangles indicate approximately where the relays are located on the other side of the board. So these relays don't disconnect the PV array from the SCC; they disconnect the output of the SCC from the battery. So these won't help if your array voltage is a little too high (above 145 V) on a cold morning. Last edited by coulomb on Mon, 16 Jan 2017, 09:34, edited 1 time in total. Last edited by eliafino on Thu, 14 Jul 2016, 20:39, edited 1 time in total. Real Name: Erdem U. A.
Hi everyone on the thread. What happened when the unit switched into bypess/Line mode, due overload? the Line in directly connect to output via safety relays and output relay. As I understand, units power rating became irrelevant at this point and sky is limited with relay ratings. For example if we need to use more than 4kw for some minutes, let's say 8kw, unit will switched into line mode after some seconds. Than will return to battery / PV mode back again automatically? Or do we need switch that mode manually? I believe the setting 06 : "Auto restart when overload occurs" is related with that but I wanted to be sure from the operation. If units work with that principle, I am more interested to buy PIP-2424HSE modal. 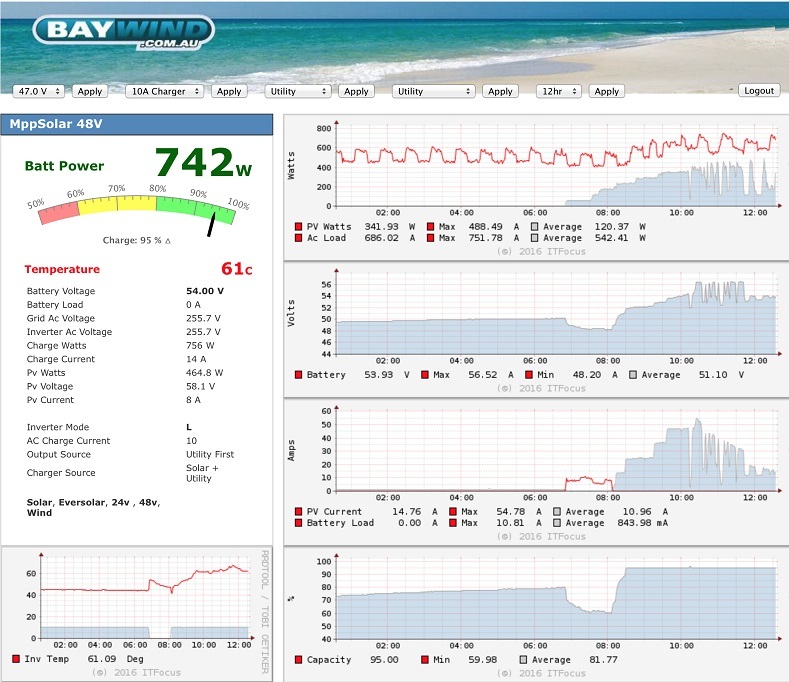 My home power consumtion does not even close to 2400w. Barely pass 2.1Kw on normal usage. So I am OK with dropping into line mode once a month. E.U.A wrote: Hi everyone on the thread. What happens when the unit switched into bypass/Line mode, due to overload? I believe so. Others who have used these units for some time (mine isn't yet installed) can confirm or deny. In function OPPowerBatPercentMaxCal(), an adjusted power level is calculated. I think what they are doing is scaling the present load carried by the mains, and calculating what percentage of full load this would be if the inverter (which always produces 230 V) were to carry it. I believe that they assume a resistive load, though I could easily be muddled by the maths (I have to read it in DSP assembler). This power is compared with 110% and 85%, with a function that wants to see the value consistently above or below these limits respectively for 5 checks in a row (I think that means for a sixth of a second total; these things tend to be checked 30 times per second). If the load is over 110% for this time, LoadAbnormalFlag is set. If under 85% for 5 checks in a row, LoadAbnormalFlg is cleared. I haven't checked all the uses of this flag; it gets complicated by consideration of paralleled machines. But I'd say it's pretty safe to say that these limits are used to switch the unit back to battery operation (if that's appropriate, considering other settings and conditions) when the load has been under 85% of rated power for a short while. 85% of 4000 W is 3,400 W. It might work on VA if that works out worse for the inverter, so it might not always be exactly 3,400 W. It might switch back at 85% of rated VA, so for the PIP-4048 this would be 0.85 * 5000 VA = 4250 VA. So if you have a load that alternates between say 4600 W and 3600 W, then it would stay in bypass mode. But if it alternated between 5000 W and 3000 W, then it would switch back to battery mode soon after the load was low (3000 W), and bypass mode soon after the load was high (5000 W). For smaller units, I'd imagine that the same thing applies, but just at lower limits. I have seen my 4048 switch to bypass only on low battery voltage and only when using one unit, With both units on in parallel this does not work. I have my pair set up so one runs all the time and the output is run thru a digital current switch as the first units output gets up to about 70% the second pip gets switched on and comes online for about 30 minutes thru a timer before switching off. Each time the current switch reaches its set point the timer is reset, this works well with the likes of the oven thermostat and is simple. Most days the second pip is on less than an hour or two for a good standby power saving. Monkeytom wrote: With both units on in parallel this does not work. It's just dawned on me why they don't allow bypass on overload with paralleled units. They would never switch at exactly the same instant, so the second inverter to switch would be attempting to apply power to the mains. It would not be synchronised in voltage or frequency, so this would be considered harmful. I like your solution, though it may not suit everyone. Last edited by coulomb on Sun, 11 Dec 2016, 04:49, edited 1 time in total. Monkeytom wrote: I have seen my 4048 switch to bypass only on low battery voltage and only when using one unit, With both units on in parallel this does not work. Are you saying that, when units are operating in parallel, bypass will never occur for any reason, including low battery voltage? Even when all units have parameter 23 set to enable bypass on overload and parameter 1 is set to enable bypass on low voltage? So what do they do when either of these events occur? Do they just shut down and leave the loads without power, despite there being mains available? coulomb wrote: It's just dawned on me why they don't allow bypass on overload with paralleled units. They would never switch at exactly the same instant, so the second inverter to switch would be attempting to apply power to the mains. It would not be synchronised in voltage or frequency, so this would be considered harmful. I don't understand why they can't switch simultaneously, either when any one of them is overloaded, or when the designated master is overloaded. How is this different from switching on low battery? They have some cables connected between them on which they could communicate this. When we say "simultaneously" all that is required is that both relays are in the break-before-make state at the same time. Within a millisecond of each other should be sufficient. And why would they not be synchronised to the mains frequency? This is important even in single unit operation since some loads such as transformers and induction motors may draw large current spikes when switching between unmatched sine-waves. Last edited by weber on Thu, 28 Jul 2016, 11:00, edited 1 time in total. coulomb wrote: It's just dawned on me why they don't allow bypass on overload with paralleled units. Upon reflection, I've decided I must have been thinking of something else. I now can't find anywhere that says you can't bypass on overload with paralleled units. Mine went into fault and dropped the load when it was in parallel with low battery . I can't tell you what it would do on overload haven't been there yet. I feel if AC mains is connected the pip will be in phase with the mains shortly after coming on line. I have found switching between pip and grid and grid and pip is no problem providing the pip has AC mains connected. Otherwise the two light bulbs works well. I've had a request from someone on the South African PowerForum to ask users here how long we've been using our PIP invertets. He says he believes that they have only been in use there for 18 months to perhaps 2 years. I've certainly seen PIP-4048 inverters from 2013. Back then, they may have been using parts (MOSFETs specifically, but perhaps also capacitors) whose specifications were very close to their real-life usage, especially when used with a flooded lead-acid battery. They seem to use slightly higher-spec parts since about 2014, which seems to have improved reliability. Have I got this about right? Has anyone used an inverter made 2012 or earlier? Any comments about the reliability of the earlier models? Last edited by coulomb on Sun, 31 Jul 2016, 04:39, edited 1 time in total. I had lots of failures with early 2013/2014 4048's. MOSFET failures and fan failures. 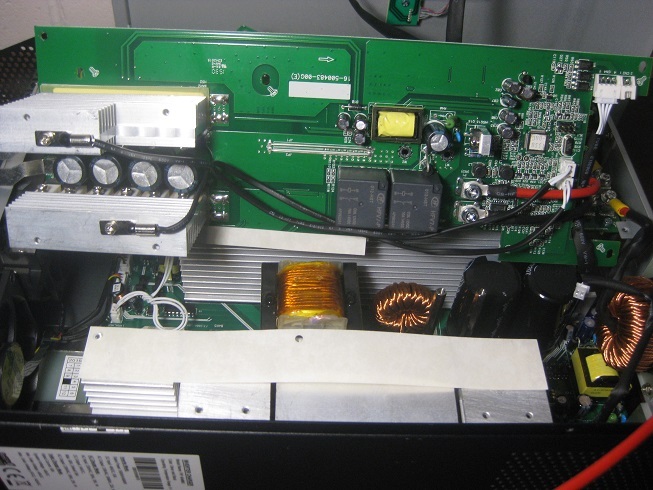 Fan failures caused overheating and 12v regulator failure. 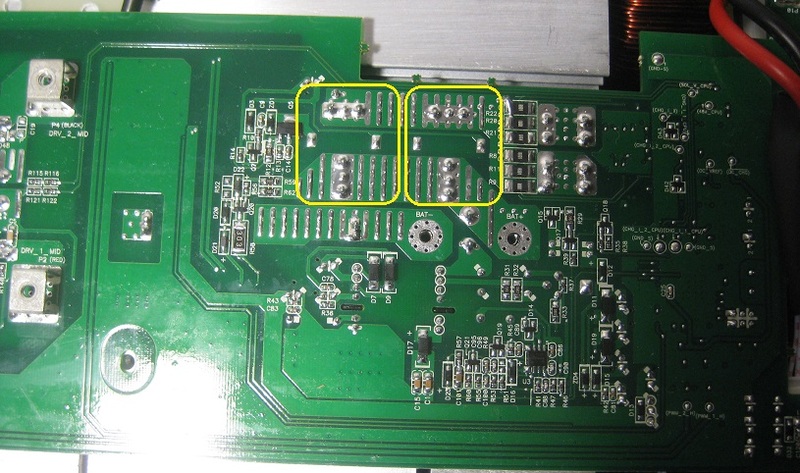 The fan problems stemmed from corrosion of the fan soldered terminals. There are 4 terminals. 2 for power in to run the fan and 2 for the run signal sent to the CPU. Shorting of the power in terminals could lead to failure of the 12v regulator which also supplies power to run the inverter control. Later model fans have the soldered terminals coated plus I apply lanolin grease. I would have had 30 4048 failures at least but now not many at all. If you even think you will be needing 1000 watts or more from a battery system you need to go to 48V drawing high current from batteries always means you drop voltage. Compared to other systems on the market the MPP solar products are cheap enough to buy almost 3 for the cost of the others. 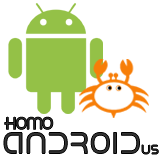 I have seen great improvements in them and they have appeared to fix many of the earlier problems. There are more improvements that could be done with the firmware and the addition of a battery backed clock in hardware would be a huge enhancement. The units have performed well and have nearly paid for themselves in power bill savings I estimate 6 to 7 years for whole system to be paid off. I hope my experience with them helps in your decision making. Last edited by paulvk on Tue, 02 Aug 2016, 10:38, edited 1 time in total. I'm setting up an off-grid system with a LiFePO4 battery bank, and I just got a PIP-4048MS a few weeks ago. Option 30 is set to "ONE" but can be changed to "ALL". While I wait for a reply from MPP Solar, just wondering if anyone knew what it is? EDIT: Just got a reply, turns out its for Parallel Unit operation, so I can ignore it. Last edited by andys on Fri, 26 Aug 2016, 12:03, edited 1 time in total. I put the photo in the earlier post, so that there are now 6 versions (from 6 years, amazing), all in one place, accessible from the index. It's a bit strange that it has no transformer or 2-pin connector for power (marked HFPW), so now I'm wondering if it's different to the 4 kW / 5 kVA models. Can anyone confirm? Have you ever done tests to understand the working of the dll and its calls so can work directly (under vb6 - vs - c# - arduino - raspberry etc.) as you do with the RS232. Last edited by Fotosettore on Sun, 28 Aug 2016, 11:13, edited 1 time in total. 2 PIP4048MS inverters, 24 250W panels, 12 AGM 260A batteries. Software LUCIBUS e synoptic monitor VIÁTOR. Last edited by ChrisHobson on Sun, 28 Aug 2016, 23:13, edited 1 time in total. Fotosettore wrote: ....raspberry etc.) as you do with the RS232. So I was installing my lifepo4 cells, decided to measure the idle current for my PIP802HS (12v 800w). And got 2.8A at 13.4v. Didn't think much of it at first. Then I did the math in my head and alarm bells rang. The whole point of me having a separate 12v system was to reduce the draw on the batteries at night by using a smaller inverter with a manufacturer rating of <15w vs the PIP4048MS rating of <50w. So having confirmed the actual idle draw of 37.5w on the smaller inverter proves the manufacturer rating of 15w to be a lie, I wonder if the rating on the bigger one is also a lie? Has anyone checked this? Mine is suffering from fault code 9 if anyone has any info? Manual says internal component failed. This occurred when my float voltage was set at maximum 58.4v. It's not a capacitor, I've inspected visually. No pop, no fizz, no smoke. 2. Used 10pc latching relay for control. Bought some other types (60A from another manufacturer) and found the 100A ones had much bigger contacts and a much bigger gap. 4. Connected a 12/24/48 charge controller to 12v AND 48v banks. When the 48v bank is full relays will swap it to a 12v system. It's not finished but manually (Electrically as opposed to arduino control) proves it works as it should. On the 48v and 100v side I'm using 2 latching relay poles on 48v (pulse only, remember these have a 24v rated coil). My research suggests this is safe and results in faster switching. There is minimal spark on the PV side at peak current of 30A (the rest goes into the PIP4048MS). Have not installed capacitors to see if can reduce further. Visual inspection of the contacts after 20 switchings don't show any damage. 5. Installed a water Heat Pump. Reducing my kwh on water heating by 75%. Thus I get a better soc every day. Also it has a timer, thermostat and lcd display. By starting it 4hrs before shower time it reaches max temperature when it's actually used. It doesn't run after shower time, heating the water then cooling over the next 16 hrs. That's inefficient. 6. Replaced the wife's desktop with a raspberry pi. From 140w down to 4w pi + 20w monitor. It runs most of the day. Considering putting the dishwasher water intake on to the hot water tap. Currently it expends a huge amount of power heating the water from cold. The heat pump can do that work using 75% less power. Going back to the idle current for the small inverter, this got me thinking. If I'm not using the PIP802HS scc, and not connecting it to the grid, why not ditch the inverter (/charger/scc/grid tie) entirely and instead install an efficient small sine wave inverter for night loads? I came across victron Phoenix which has an idle draw of 6w and is 48v, ie no need for a 12v system anymore. So some of my innovative trickery may be for nothing. But for now I've ordered a cheaper Chinese inverter claiming to have low idle draw. I will test that. If it can't run the fridge, TV and lights I will go for the Phoenix. My goal is to build the most efficient off grid setup in.the.world. 90% of systems use lead acid so they are already out. Anything using a contactor to protect lifepo4 24/7 is out. Anything not using arduino BMS is out. So I may have already won the race before installing the low idle inverter. It bothers me that so many systems waste power willy nilly. For example Justin Case on YouTube who runs a laptop 24/7 just for monitoring, then wonders why he is on his 3rd set of batteries in 4 years! And is frequently running a generator. I'm also toying with the idea of increasing batteries and decreasing pv panels. I will need to do some measuring and some math. I imported 64 200ah cells and currently have 16 on the 48v bank. I planned to sell the rest to cover the cost of the 16+4 I'm using. But maybe I install all 64 in 16S4P and sell off my east and west 250w panels. You might say more cells requires more panels, not less. But you might be wrong. I know my average consumption overnight is 80ah (4.1kwh). On a 800ah bank that's 10% dod. And that's using the pip. I will get much better on the victron. Last edited by Northland on Mon, 29 Aug 2016, 04:22, edited 1 time in total.